When we went to Ireland recently, I noticed that old castles and other ancient structures are not removed like they are in the United States. In the middle of a thriving town, you'll discover a thousand-year-old ruin covered in flowers or an old turret erupting out of an emerald field. Here in the U.S. we typically don't see the same reminders of history that we see throughout Europe. Obsessed with the new, we bulldoze down anything that seems outdated or rundown. My friend Jo tells me a story about how in the 70s when she lived on the original Ashburn Farm, a magnificent estate now home to 6000 residences, the construction crew came one day and bulldozed the old mansion. Over night, everything -- the doorknobs, the hand-carved mantles, the fixtures -- all went into a big dusty pile to be hauled away. It remains one of her saddest memories. To me, one of the most powerful things we can do to maintain a sense of Place is to keep our old buildings as a reminder of where we come from and who we are. 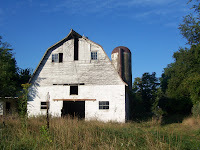 Rather than tearing down our old Barns, for instance, perhaps we can re-use or renovate them for other uses (restaurants, homes, meeting places). You'll see excellent examples of reusing old Mills, old Barns, old Victorians throughout Western Loudoun in ways that are beautiful and full of charm. I think this is why Western Loudoun -- like Old Town Winchester, Old Town Alexandria and Del Ray -- is such a desirable place to live. By blending the old with the new, we maintain a sense of the past that many, including me, find to be the foundation of what makes a Place truly unique.